It’s hard to believe today after more than 30 years of local dominance, but WFTV-Channel 9 used to be the least-watched station for Orlando TV news. 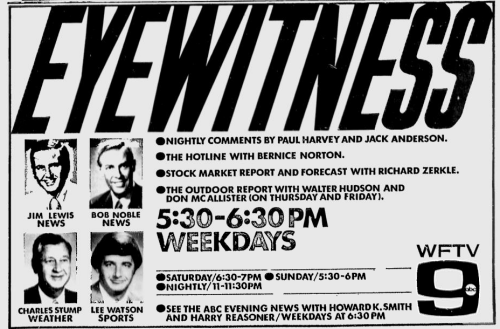 Here’s a newspaper ad from that era — when “Eyewitness News” was just called “Eyewitness.” This advertisement from November 1971 shows that WFTV was trying — it had expanded its early evening news to a full hour, following the lead of WESH. The hour-long format didn’t take last — and it wouldn’t be until 1981 that Channel 9 went back to an hour of news in the early evening.